The Chimney Swifts are coming! If you don't want to share your chimney, you need to cap it BEFORE they nest. These birds are Federally Protected. Chimney Swifts can eat their body weight in mosquitoes daily - so a valuable resource for us all. Every Chimney needs a cap for the same reason every home needs a roof. Black Knight uses only stainless steel caps. These will not rust or discolor your chimney, and come with a lifetime warranty against corrosion. The inverted cone design prevents creosote icicles. Methods for Chimney Cleaning have changed over the years. In Europe, they used "climbing boys" who literally climbed up the inside of a chimney brushing out the soot. In this country old-time methods ranged from filling the base with dried grass and burning the chimney clean, to tying a goose on a rope & pulling it up the flue letting the goose's wings flap the chimney clean. With goose's job done, it then had the honor of being dinner. However today's methods are a bit more refined, using steel brushes connected to flexible rods that scrub the side walls of chimneys. Plus there are special vacuums with high micron filters that prevent soot from filling homes or dusting rooms. Heavy canvas drop cloths cover all the work areas. The flexible rods are up to one inch diameter which are capable of sweeping chimneys up to 125 feet high. Actual sweeping methods vary depending on home and chimney construction. Most open wood burning fireplaces are swept from the inside. This method allows for cleaning of smoke chambers, smoke shelf areas and controlling the amount of soot and dust coming down into the home. Smoke chambers are triangular areas that funnel smoke into the actual chimney. Smoke chambers can not be cleaned from the top of a chimney. Smoke shelf is the area behind the damper. Smoke shelf areas are where most chimney fires start. Smoke shelves vary in size with some being huge and capable of holding vast amounts of soot and creosote. Smoke shelves must also be cleaned to prevent hot, unaccessible fires in this area. Wood stoves, fireplace inserts, add-on wood /coal furnace flues are normally swept from the top down. High micron vacuums are used to control soot and dust. Every job is different, as is every home and individual. Black Knight has the knowledge, experience and abilities to address each situation and treat each job accordingly. There is no one shoe fits all approach with trained, experienced employees who will treat your home as if it were their own. Lightning strikes and chimney fires damage your chimney, Black Knight Chimney specializes in Insurance Investigation and repairs for chimneys and fireplaces. We use video scan technology for immediate recordable documentation. Sadly, many homeowners will experience first hand the danger and damages from a chimney fire. It is very important to regularly clean your chimney to avoid this. Unseen dangers can result from even a "small" chimney fire. If the fire department comes to your aid and states that the chimney has been cleared, there is still a risk of damage to the tile liner that could expose the structure of your home to extreme temperatures and flue gas hazards. Always have a chimney inspection done after a chimney fire. Chimney fires are almost always covered by homeowner's insurance policies. 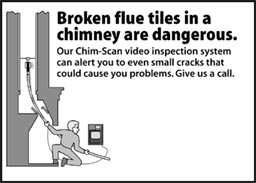 Black Knight Chimney, Inc. employs video scan technology to verify the extent of damages due to chimney fire. Smoke chambers are triangular ares that funnel smoke into the actual chimney. Smoke chambers can not be cleaned from the top of a chimney. Smoke shelf is the area behind the damper. Smoke shelf areas are where most chimney fires start. Smoke shelves vary in size with some being huge and capable of holding vast amounts of soot and creosote. Smoke shelves must also be cleaned to prevent hot, unacccessible fires in this area. 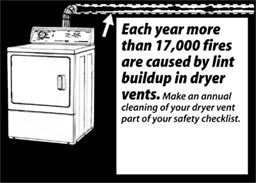 Call Today to Schedule a cleaning for your dryer vent! Black Knight Chimney, Inc. can provide you with a custom fit chase cover and caps. Protect your home from water damage and keep birds and other small animals out of your chimney with a custom fit chase cover and caps. All our chase covers and caps are stainless steel and custom made to fit your chimney. Your source for flexible and Golden Flue Cast In Place Liners to fit your needs. Cast in place liners reinforce the chimney. It is a one piece solid cast liner from the top of the firebox to the top of the chimney. Other liners only start at the top of the smoke chamber to the top of the chimney. . The smoke chamber is a crucial area to be covered, since this is where most fires spread to the structure of the home. Golden Flue is the only pumped masonry liner UL listed by Underwriters Laboratories. Golden Flue poured in place liners are the best lining systems available today for repairs to any masonry chimney when strength and integrity to the structure is requested. Gold Flue liners allow you to burn any fuel from gas, oil, wood, or coal. Golden Flue Liners are for masonry repairs that meet all of today's standards and code requirements. The cast masonry liner is made from volcanic rock so it is fireproof. Within the rocks are thousands of microscopic air pockets, making it very light weight and of excellent thermal insulated quality. Don't Replace your Chimney, Reline it! Stainless Steel flexible liners are available to custom fit to your chimney. Heavy wall liners: good for all wood and coal burning applications. We use lighter gauge stainless to handle the combustion gases produced by oil and gas burning appliances. Turning inefficient, heat wasting open fireplaces into efficient heat producing,energy saving appliances, capable of heating 40% to 100% of home's needs. Black Knight Chimney is a dealer for Regency gas & wood burning stoves and inserts for Fireplace Products International (FPI).. Done once, done right. Black Knight Chimney, Inc.